1. Tommy Skakel has lied to authorities about the night of October 30, 1975. 2. Michael Skakel has lied to authorities about the night of October 30, 1975. We know Tommy Skakel lied, because he, admittedly, altered his story to now include highly relevant facts he purposefully concealed from the Greenwich Police Department, Dr. Lesse, and others. For example, he told the Greenwich Police and Dr. Lesse that the last time he saw Martha Moxley on the night of her murder was at the side of his house, around 9:30 pm. He has subsequently advised Sutton Associates that he actually spent approximately, an additional thirty minutes with Martha, engaging in a sexual encounter. If he was not lying then, he is lying now, and visa-versa. We know Michael Skakel lied, because, in terms of his story, he did the same thing as his brother. If he was not lying then, he is lying now, and visa-versa. We suspect Ken Littleton has lied because he failed at least two lie-detector tests. This remains only a suspicion, however, because the results of these lie-detector tests (administered under circumstances unclear to Sutton Associates,) cannot entirely be trusted. 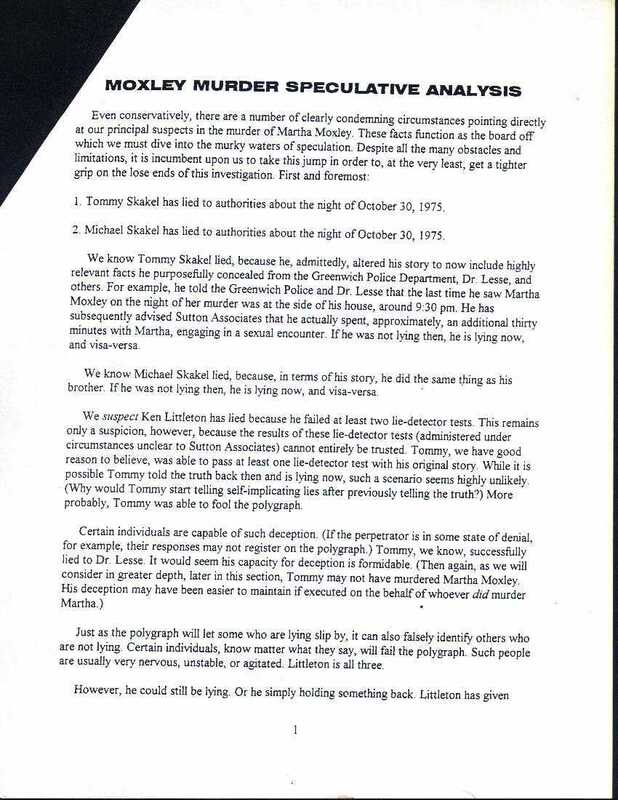 Tommy, we have good reason to believe was able to pass at least one lie-detector test with his original story. While it is possible Tommy told the truth back then and is lying now, such a scenario seems highly unlikely. (Why would Tommy start telling self-implicating lies after previously telling the truth?) More probably, Tommy was able to fool the polygraph. Just as the polygraph will let some who are lying slip by, it can also falsely identify others who are not lying. Certain individuals, know matter what they say, will fail the polygraph. Such people are usually very nervous, unstable, or agitated. Littleton is all three.